We're at another Friday and there is much rejoicing! 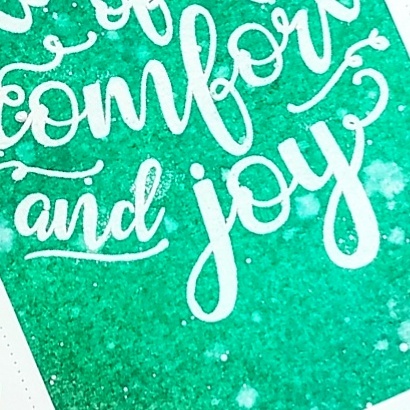 So, tomorrow on the Butterfly Reflections, Ink craft blog I'll be sharing a special Christmas in July card. Here is a sneak peek! Because I'm doing a holiday card, I thought it'd be fun to share our favorite holiday traditions. In my thirty something years of life, I've never known a year that we haven't done these traditions. Some people would say that's ridiculous. I think it's wonderful. My siblings and I are all married with our own families, yet we still carry on these traditions together and then individually in our own homes. Not only have we continued the same traditions since we were kids, we've added new ones since adding new family members! Although the months of November and December are just one long marathon of parties, events, traditions, and celebrations, I love it all and wouldn't want it any other way. The holiday season officially kicks off with Black Friday shopping and we still get up super early, even though the stores have already been open for at least 5 hours. We don't like to rush through our evening meal on Thanksgiving meal, and so we just get up early on Friday instead. And in recent years, it's been working out great since most of the stores are totally empty at those hours since all the REALLY crazy people went out at midnight. The weekend after Thanksgiving, we put up the Christmas tree at my parent's house. My parents have been collecting ornaments and knick-knacks since we were all babies, so needless to say, the tree is quite full. It's always fun to pull out all the ornaments from their custom-made storage boxes that my dad has fashioned from cereal boxes and newspaper and remember the stories behind them. On Christmas Eve, we gather at my parent's house for a meal that consists entirely appetizers. So basically, it's my favorite meal of the entire year. What is this magical meal called, you ask? Finger Foods. Because clearly, we are super imaginative at naming our favorite meal of the year. We hang our stockings at my parent's house (there are currently 9 stockings to be hung every year between the children, spouses, and grandchildren. ), and also watch a holiday movie and play games. On Christmas Day, we gather at my sister's house and open out gifts to each other, and it's always a sweet time. We also spend an inordinate amount of time taking holiday photos in front of the tree, and that is my brother's favorite part (and by "favorite part", I mean he hates it so much and complains like a 2 year old). We also eat a very traditional Christmas feast of ham, veggies, and other delicious side dishes--and then we finish off the meal with 16 different kinds of pie, so it's essentially a great day. These traditions have been a staple since I was a child, but it's been fun to add the new traditions over the years, too. A few years ago, my sweet sister-in-law started hosting a Christmas Eve brunch, and we've been going that for several years running now. My sister and I started a tradition over ten years ago of running around like crazy women the week before Christmas picking up stocking stuffers for our husbands. Ten years ago, I was keeping her company while she got stocking stuffers for her husband. But for the last couple years, I've been joining in the fun of picking up last minute things for my guy, too. My dad and I always cram as many holiday movies into the evenings between Thanksgiving and Christmas that we possibly can, and that is another highlight of the season for me. Because.....Muppet Christmas Carol--HELLO?!?!? Christmas is always a special time for us, and I'm grateful to have a loving family that enjoys being together. Thanks for reading about my love for the holiday season, and maybe this blog post has made you forget about the scorching heat of summer for a few minutes! Only 23 more weeks til Christmas!